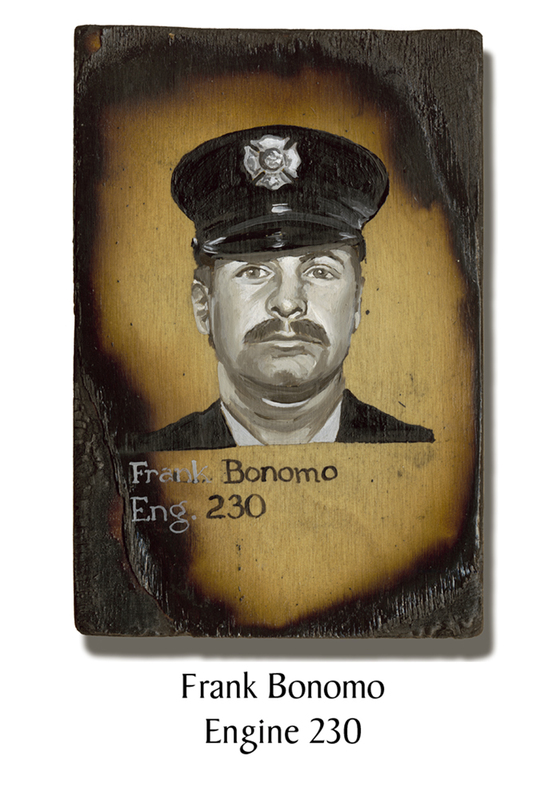 Frank Bonomo, of Engine 230 was 42. With 17 years in the department, retirement at the 20-year mark had begun to look appealing, partly because he now had two young children, aged four and one. Nicknamed “M&M,” Bonomo looked hard on the outside, but had a big heart. Had he retired, he would have made more of his part time TV and video repair business. But his favorite thing to do was play golf. He was determined to get good enough to play the Senior Tour when he retired. Although known for not being handy around the house (except with a TV), he invested months installing a putting green in his yard so he could practice at home. This entry was posted in Better Angels Stories and tagged 343, 9/11, better angels, Dawn Siebel, Engine Co. 230, FDNY, firefighter, firefighters, firefighters of 9/11, Frank Bonomo, LODD, Manhattan, memorial, NFFF, paintings, portraits, World Trade Center, WTC. Bookmark the permalink.